When it was first released in 1969, Rolling Stone panned Santana’s eponymous debut album as “frantic music with no real content,” suggesting it best to forget it altogether. Thirty-four years later, the magazine placed it at 150 on its list of the 500 greatest albums of all time. Craig will open this week’s Vinally Friday with a few spins off the classic record, which propelled to the top of the charts shortly after its release – in no small part due to the band’s explosive performance of “Soul Sacrifice” at Woodstock. 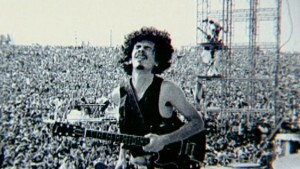 Santana was the first in a long string of hits for the pioneering Latin-rock band. Thirty-five-plus years later, the band has released 24 albums and has been home to 67 different musicians – Carlos Santana the only one to stay on since the beginning. Alanya will follow up with another classic – Grateful Dead’s 1977 release, Terrapin Station. This album, too, didn’t necessarily go over too well with fans and critics, who complained about the band’s departure from its traditional jazz, blues and folk style into a territory of more complex and symphonic sounds: horns, strings, a choir (you get the drift). But today it’s considered among the band’s best – many of its tracks a big part of Dead shows for decades to come. Check out the AllMusic review HERE. Robert’s hosting the Trail Happy Hour this week, so he’ll take things easy with a “Best Of” show featuring some of the vinyl he’s showcased in Vinally Friday’s past. 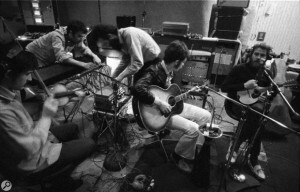 -American roots rock group The Band. Also known as the “Brown Album,” The Band is a concept piece focused on the people, places and traditions of Americana. It also includes some of the band’s most celebrated songs, such as “The Night They Drove Old Dixie Down” – Rolling Stone’s 245th greatest song of all time. Check out lyrics and background on that classic track HERE. There ya have it – another spin of the ol’ turntable to mark the beginning of the end of another great week of music. Vinally, it’s Friday – it’s Vinally Friday, only on the Trail!